Sputnik. The first artificial satellite, the launch of which precipitated the space race. Without the frenetic pace of technological advancement as the USA and the USSR vied with each other during the decade following its launch it is safe to say that we might not yet have many of the tools and components we take for granted as electronics enthusiasts and makers today. [Frank Waarsenburg PA3CNO] has taken on the interesting task of recreating one of the Sputnik radio transmitters using a set of the original Russian tubes. Sputnik itself was an astounding achievement for the team of engineers and scientists who put it into orbit, but the drive to beat the USA to the post within the 1957 International Geophysical Year meant that it was a surprisingly simple device. A sphere pressurised with nitrogen and with those iconic whip antennas mounted on its outside, containing a battery, 20 and 40 MHz tube radio transmitters, and a fan cooling system. Its design was a Soviet state secret, but in 2013 [Oleg, RV3GM] located the schematic used for the transmitter. The tubes are slightly unusual, being a wire-ended design with all electrodes mounted on rods the length of the glass envelope. This design feature gave them a resistance to acceleration and vibration, making them suitable for use in aircraft, missiles, and rockets. [Frank] faced one or two hurdles during his construction, including the development of a suitable power supply and finding an unfortunate bug in the Russian schematic. If you speak Dutch or are prepared to use a translation tool his full write-up can be found in the Dutch-language RAZzies magazine, December issue featuring the power supply (PDF, Dutch), and January issue featuring the transmitter (PDF, Dutch). The Sputnik satellite has not appeared on its own in these pages before, but we have recently featured the early OSCAR amateur radio satellites and the revival of a piece of space-race-era Soviet rocket technology. Via [Stefan, HB9TWS], whose English-language coverage of the transmitter was of great help. 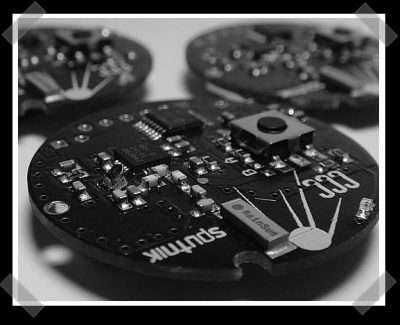 The OpenBeacon project is an open source hardware and software active RFID device. OpenBeacon tags consist of 2.4GHz transceivers and a PIC16F684. One use of the project was to create CCC Sputnik to show the downsides to information culled using data mining from large tracking systems. People who chose to participate and wear the Sputnik tags did so voluntarily to create a database of material for further study. The hardware schematics (PDF) for the first version tags as well as the firmware for all versions has been released. Further creative uses of the OpenBeacon project are strongly encouraged. As a reminder, the 24C3, the 24th Chaos Communication Congress, call for participation ends on October 12th. The theme this year encompasses all hardware projects and more specifically, steampunk themed submissions. Check out the CCC events blog for more information.